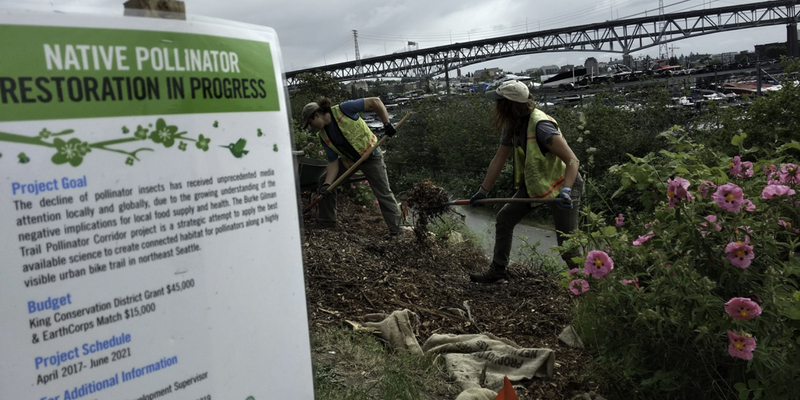 EarthCorps seeks a volunteer Environmental Restoration Crew Member for the period of June through December 2019 for work around Puget Sound. EarthCorps is a Seattle, Washington-based nonprofit organization with a mission of developing leaders to strengthen community and restore the health of our environment. EarthCorps’ Corps Program is an intensive year-long training and service opportunity. We unite young adults (age 18 and above) from across the United States and around the world to learn skills in habitat restoration, leadership, and community building. EarthCorps program participants are part of a diverse group of emerging environmental leaders committed to teamwork, service, and personal growth. Crew Members are the ones out in the field every day working on teams and doing the physical service necessary to restore green spaces across the Puget Sound region. The Crew Member position is a training-level, seasonal position with EarthCorps. As an AmeriCorps Member, Corps members will work on outdoor environmental restoration projects throughout the Puget Sound Region. Their work directly improves the resiliency of our land by restoring habitat, improving water and air quality, reducing erosion, sequestering carbon and engaging the broader community to become stewards of our shared resource. Enrolled in AmeriCorps through CNCS. This is a half-term (900-hour) AmeriCorps position. AmeriCorps members must abide by policies set by CNCS and complete at least 900 hours of service, including mandatory trainings. Overnight retreats and education sessions must be attended to fulfill program requirements. See full information on opportunity.